Rebecca appears as Counsel in a wide range of criminal matters including jury trials, sentences, appeals, contested hearings and sentence matters in both the District and Local Court as well as a variety of mental health applications. In the Children’s Court Rebecca has appeared in Children’s Serious Indictable Offences and Child Sexual Assault Pilot Scheme involving the pre-recording of cross examination of all complainant and child witnesses prior to trial. After admission Rebecca worked for the Western Aboriginal Legal Service at Dubbo appearing in criminal courts throughout western NSW before moving on to Legal Aid NSW working in their Penrith, Liverpool, Campbelltown and Newcastle Offices. Whilst at Legal Aid Rebecca undertook work in the Children’s, Local, District and Supreme court criminal jurisdictions. 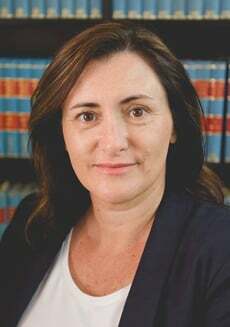 Rebecca attained specialist accreditation with the NSW Law Society in both criminal law and advocacy and has extensive experience in criminal committal and indictable work. Rebecca is a Guest Lecturer in criminal plea making at Newcastle University Law School.